I Am NOT A Pencil-neck Geek. I *AM* A Pencil Geek. Big Difference. 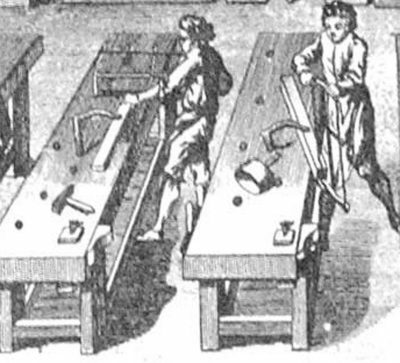 Beginning with Mr. Tefft’s seventh grade drafting class I have been fascinated with pencils and their sharpening. 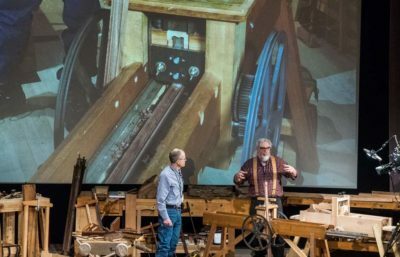 I am by no means an expert or total sharpener history aficionado like Mister Stewart or Chris Schwarz, who can regale each other with tales of pencil sharpener arcana in perpetuity (which I have witnessed) but I am appreciative of the technology, especially when it works properly. 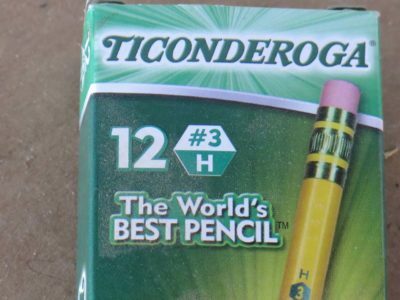 The whole notion that the world of pencils was so much larger than the mundane No.2 we needed to complete standardized testing captivated me. Between my years in junior- and senior-high drafting classes and my subsequent years as an architecture student, back in the day when we still rendered our plans by hand in pencil on K&E tracing paper, my attraction to both high-quality standard and mechanical pencils grew to an outsized portion. And, while I am nearly devoid of artistic talent, I loved art drawing classes because they allowed me to obtain and use an astonishing array of drawing pencils. This attraction to pencils was cemented as a utilitarian habit during my decades in the museum artifact world, where pens are generally forbidden in proximity to antiquities as they can accidentally leave disfiguring stains but pencils are much less likely to cause permanent damage. For years all of my observations were recorded by pencil in notebooks simply because that was the yardstick for the trade. Heck, even one of the greatest political tracts of all time was titled I, Pencil. 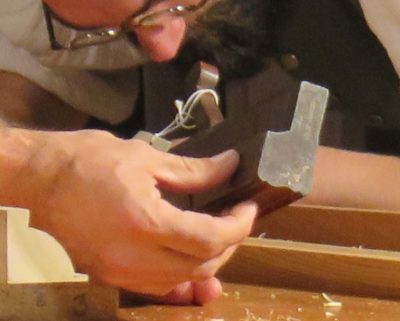 To this day I use a pencil in the shop far more than striking knives or mortise gauges and the like. I even special order No. 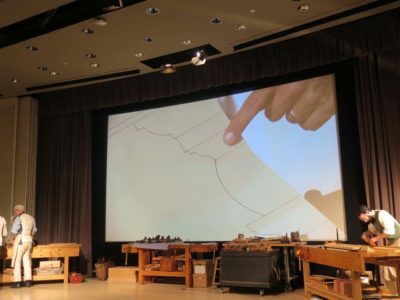 3 pencils for laying out joinery, the hardness and sharpness of the lead leaving a crisp line that incises the wood much as does a marking knife. And thanks to my long-time pal MikeM I have a stash of No. 1 pencils and he steered me toward high quality white china marker pencils, perfect for making darker woods. Due to their softness, sharpening them is a delicate task. 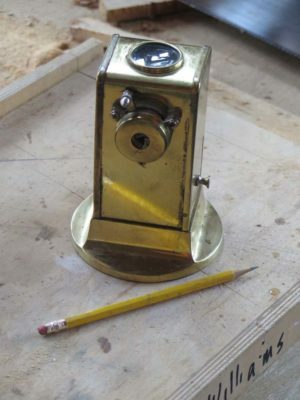 An old-fashioned pencil sharpener is screwed to the timber post immediately adjacent to the door entering my shop. For years I have obtained and tried out numerous pencil sharpeners, as I am pretty fussy about them and I use them several times a day. In all these years I have never encounter a pencil sharpener to compete with The One. 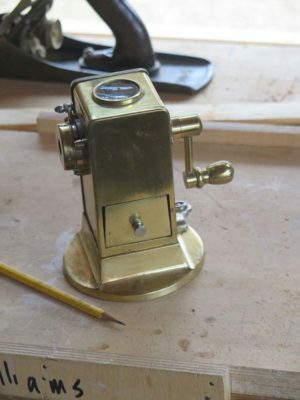 The one in Tom’s shop, the pencil sharpener by which all others were judged. Forget “One ring to rule them all.” This was important. On one of my first Wednesday evenings working in Tom’s shop I needed to sharpen my pencil and asked if he had a sharpener, honestly expecting the answer to be “No.” Instead he led me to a boxy looking thing I think was mounted to the wall. When I inserted the pencil into the device and started turning the handle I swear I could almost hear angels singing the Hallelujah Chorus. I had found The One! 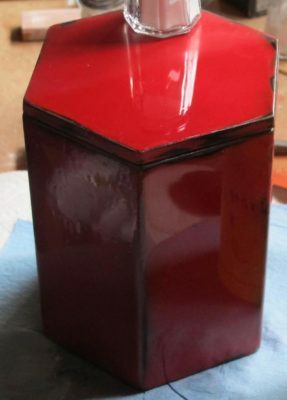 Tom’s sharpener was of Spanish manufacture and operated smoothly with none of the grinding sound so typical to school pencil sharpeners, and left a tapered tip that was flawless. I immediately looked into getting one myself but the scarcity and price scared me off. 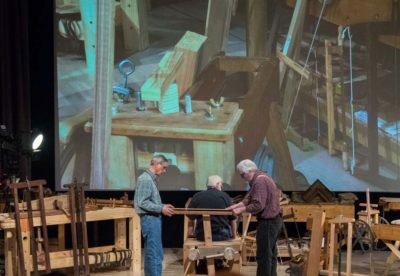 Tom mentioned that his had been a gift from his mother-in-law and was a bedrock tool for him as he, too, used pencils in his work. For years I have been waiting either for one to come up cheap on ebay.com or for me to talk myself into spending the money on one for my shop. 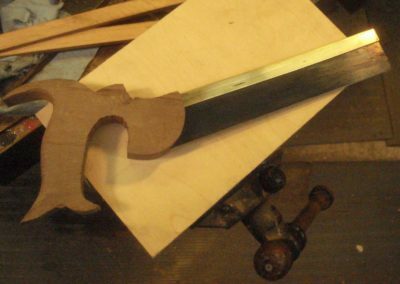 Neither event happened and I just “made do” with my ancient Boston sharpener(s) which usually yielded an excellent tip but occasionally produced one that looked like it had been gnawed on by a beaver. And now Tom was handing me a paper bag and inside that paper bag was a vintage gold-plated El Casco pencil sharpener. I was nearly speechless. Really. It will reside even more prominently than my vintage Boston sharpener on the post, this one will live on the lid of my prized walnut Gerstner tool chest (a Christmas gift from my BIL almost 35 years ago) which sits on top of my FORP Roubo bench. You just gotta keep friends like that around. 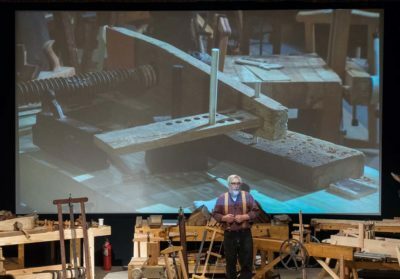 Acknowledging three truths, namely that 1) folks have been generally resistant to coming to The Barn for workshops (I cancelled three workshops last summer due to lack of interest but am more optimistic for this year), 2) I think I have something to offer to an interested audience based on my 45 years of experience in woodworking and furniture preservation, and 3) I am comfortable and can work very efficiently when making presentations/demonstrations without a lot of wasted time. Given these three things I’ve decided to jump into the deep end of a pool already crowded with other swimmers. 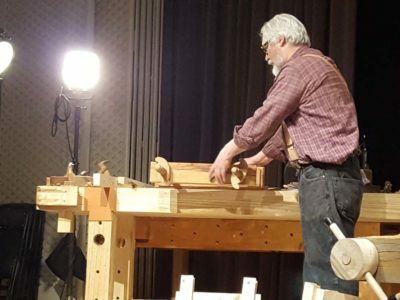 I’ve made a great many videos before with Popular Woodworking, Lost Art Press, C-SPAN, cable networks, and dozens of live interviews and such for broadcast television. I am fairly familiar with the process and recently have begun what I hope is a long-term collaboration with Chris Swecker, a gifted young videographer who has returned to the Virginia Highlands after college and some time served as a commercial videographer out in Realville, to create a number of videos ranging from 30-45 minutes to several hours. Obviously the longer videos can and probably will be cut into episodes. In concert with this endeavor has been the ongoing rebuilding of the web site architecture to handle the demands of streaming video (and finally get The Store functional). I believe webmeister Tim is in the home stretch to get that completed. 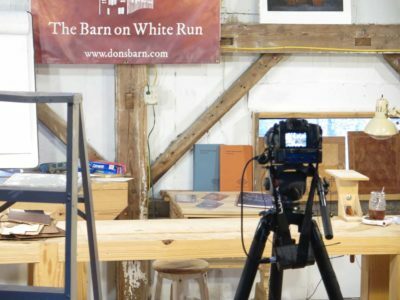 Beginning last autumn I turned the fourth floor of the barn into a big (mostly) empty room suitable for use as a filming studio. 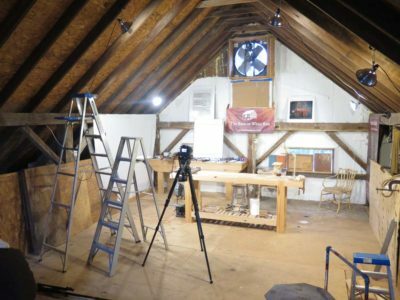 It is cleaned up, cleaned out, and painted with some new wiring to accommodate the needs but I have no desire to make it appear anything other than what it is, the attic of a late 19th century timber frame dairy barn. It is plenty big enough for almost anything I want to do. 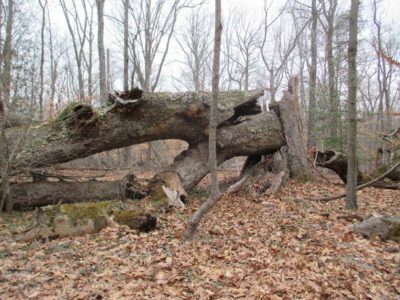 The only shortcoming is that the space is completely unheated and generally un-heatable, limiting somewhat our access to it. This issue came into play very much in our initial effort as our competing and complex calendars pushed the sessions back from early November into early December and the weather turned very cold during the scheduled filming. We had been hoping for temperatures in the mid-40s, which would have been just fine especially if the sun was warming the roof above us and that heat could radiate down toward us. It turned out to be cloudy and almost twenty degrees colder once the day arrived and we set up and got to work. We had to do our best to disguise the fog coming out of my mouth with every breath and I had to warm my hands frequently on a kerosene heater just to make sure they worked well so we could make the video. Yup, this will be a three-season working space for sure. The first topic I am addressing via video is complex veneer repair. Based on my experience and observations this is a problem that flummoxes many, if not most, practitioners of the restoration arts. It was a challenge to demonstrate the techniques I use (many of which I developed or improved) in that this requires fairly exacting hand dexterity and use of hot hide glue, and the temperatures were in the 20s when were were shooting. It was brisk and oh so glamorous. 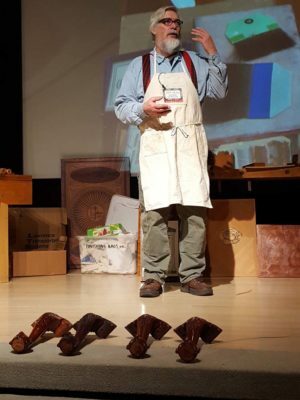 The electrons are all in the can and Chris is wrapping up the editing and post-production, so I am hoping to review the rough product in the next fortnight or so. Paying for this undertaking remains a mystery and leap of faith. I will probably make this first video viewable for free with a “Donate” button nearby, but am still wrestling with the means to make this at least a break-even proposition. I do not necessarily need to derive substantial income from the undertaking (that would be great, however) but I cannot move forward at the pace I would like (5-10 videos a year) with it being a revenue-negative “hobby” either. I want to produce a first-class professional product, and that requires someone beside me to make it happen, and that someone has to be paid. As much as I am captivated by Maki Fushimori’s (probably) I-pad videos – I can and have watched them for hours at a time, learning immensely as I do – this is a different dynamic. I continue to wrestle with the avenues for monetizing this just enough to pay for Chris’ time and expertise. I’ve thought about “subscriptions” to the video series but have set that aside as I have no interest in fielding daily emails from subscribers wanting to know where today’s video is. Based on my conversations with those in that particular lion’s den, subscription video is a beast that cannot be sated without working 80-100 hours a week. Maybe not even then. Modestly priced pay-per-view downloads is another option that works for some viewers who are mature enough to comprehend the fact that nothing is free. For other viewers who have come to expect free stuff it does not work so well. I am ball-parking each complete “full-length”video at $10-ish, with individual segments within a completed video a $1. Just spitballing here, folks. A third option is underwriting/advertising, but I find this unappealing as a consumer and thus unappealing as a provider. I have no quarrel with companies and providers who follow this path but it is not one I want for myself. Finally there is always the direct sales of physical DVDs, which remains a viable consideration. If none of these strategies work for me I will make videos only as often as I can scrape together enough money to pay for Chris. At this point I have about 25 videos in mind, ranging from 30 minutes to several hours long. Our next one will require some “location” filming as I harvest some lumber up on the mountain. Here is a potential list of topics for videos. 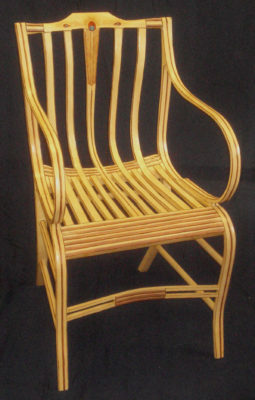 Making a Gragg Chair – this will no doubt be a series of several 30-45 minute episodes in the completed video as the project will take several months to complete, beginning with the harvesting of timber up on the mountain and ending with my dear friend Daniela demonstrating the creation of the gold and paint peacock feather on the center splat. 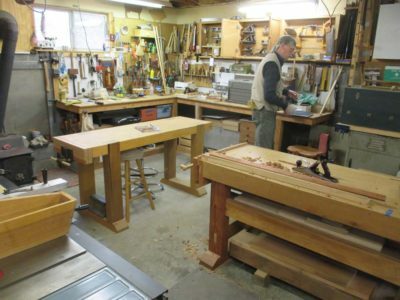 Roubo’s Workshop – L’art du Menuisier is in great part a treatise on guiding the craftsman toward creating beauty, beginning with the shop and accouterments to make it happen. I envision at least three or four threads to this undertaking, each of them with the potential of up to a dozen ~30(?) 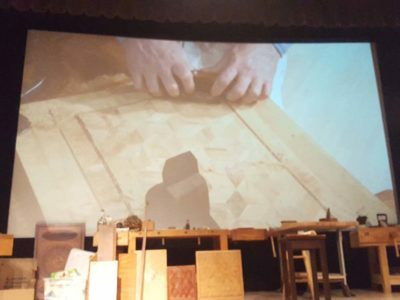 minute videos: the shop itself and its tools; individual parquetry treatments; running friezes, etc. 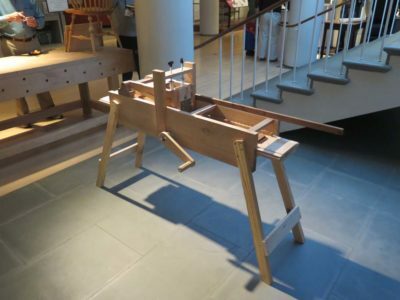 Making a Ripple Molding Cutter – A growing passion of mine is the creation of ripple moldings a la 17th century Netherlandish picture frames, and building the machine to make them. This topic is garnering a fair bit of interest everywhere I go and speak. I want this video (probably about two or three hours) to be compete and detailed enough in its content to allow you to literally follow along and build your own. 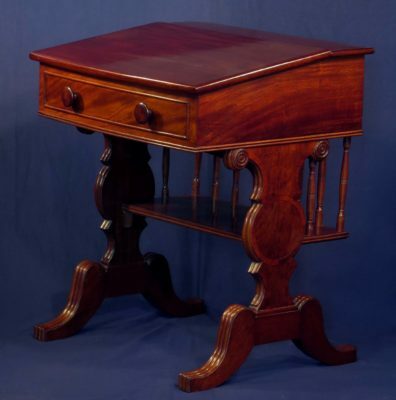 Building an Early 1800s Writing Desk – One of the most noteworthy pieces of public furniture is the last “original” c.1819 desk on the floor of the US Senate (home to a great many sanctimonious nitwits and unconvicted felons). 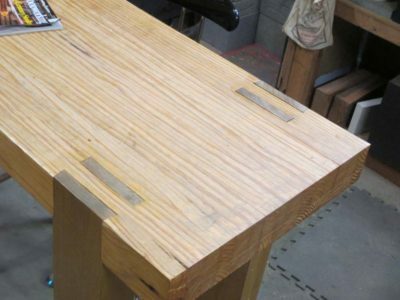 All the remaining desks of this vintage have been extensively modified. 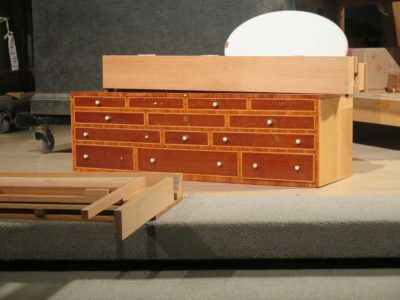 This video will walk you through a step-by-step process of making one of these mahogany beauties using primarily period appropriate technology based on publicly available images and descriptions. 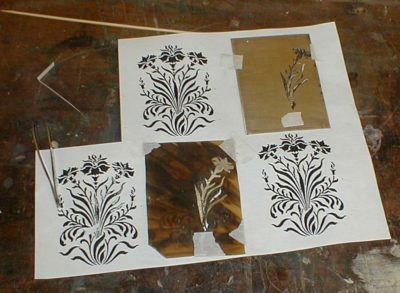 Oriental Lacquerwork (Without the Poison Sumac) – To me the absolute pinnacle of the finisher’s art is Oriental lacquerwork. It is created, unfortunately for me, from the refined polymer that makes poison ivy, poison oak, and poison sumac, well, poison. Driven by my love for the art form I am creating alternative materials employed in nearly identical work techniques. 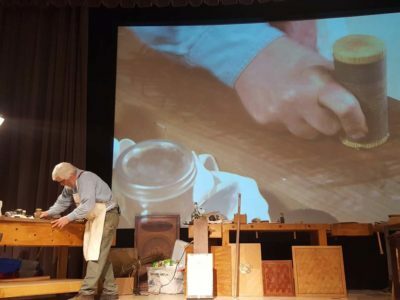 Tune in to see a step-by-step demonstration what can be done. 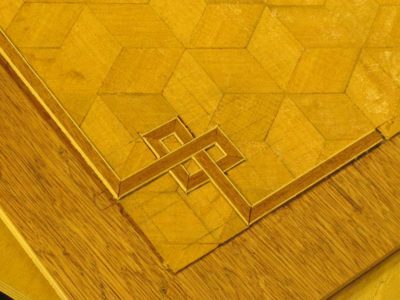 Boullework with Mastic Tordonshell – Very early in my career I loved to carve and gild, but that passion was re-directed more than thirty years ago to the techniques of Andre-Charles Boulle and his magnificent tarsia a encastro marquetry with tortoiseshell, brass, and pewter. Once I had invented a persuasive substitute for the now-forbidden tortoiseshell, a process demonstrated in exacting detail in the video, the sky was the limit. 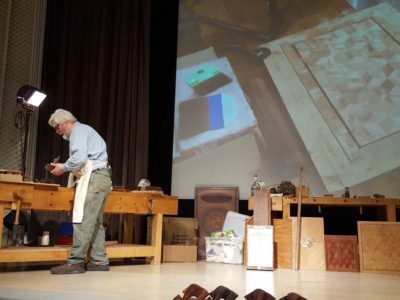 Metalcasting/working for the Woodworker – This is the video topic I am most “iffy” about as many/most folks will be trepidatious of working with white-hot molten metal. 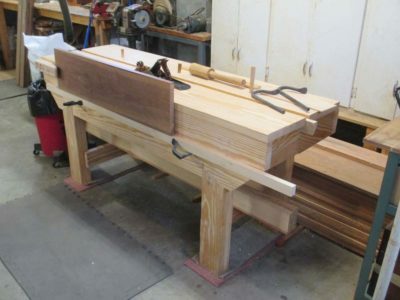 But I just might give it a try to show creating furniture hardware and tool-making. It’s possible/probable I might make this a series of specific projects to make the topic more consumable. 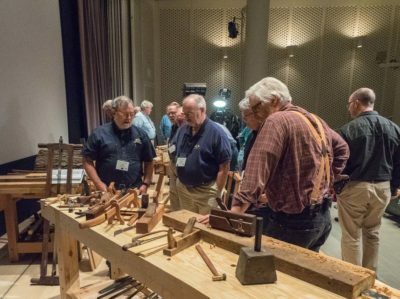 Ten Exercises for Developing Skills in Traditional Furniture Making – Based on my banquet presentation at the 2017 Colonial Williamsburg Working Wood in the 18th Century conference this series of very approachable tasks for the shop will de-mystify a lot of historic furniture making for the novice in a very non-intimidating manner. The Compleat Polissoir – starting at the point where Creating Historic Furniture Finishes left off this would be an in-depth exploration of the ancient finisher’s tool kit and will be expanded over the Popular Woodworking video (about which I am still very pleased) with a boatload of information gleaned from my in-the-home-stretch Period Finisher’s Manual for Lost Art Press. I’m sure there will be more ideas popping into my fertile brain, or maybe that’s fertilizer brain. As always, you can contact me with ideas here and once we get the new web site architecture in place, through the “Comments” feature that was disabled a lifetime ago to deal with the thousands of Russian and Chinese web bots offering to enhance my body or my wardrobe. While unpacking my “Gilding” tub for setting up my presentation at the CW WW18thC conference I removed all the stuff I needed for the show. Getting to the bottom of the tub I was dumbstruck. There, underneath all the gilding supplies — where it was not supposed to be — sat as my long-missing box of mostly mega-dollar (mostly) sable detailing brushes. 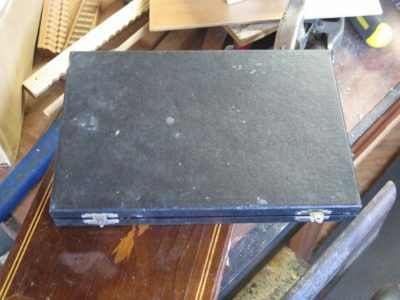 I had turned the shop upside down several times in the past three years looking for this little box of treasures to no avail. 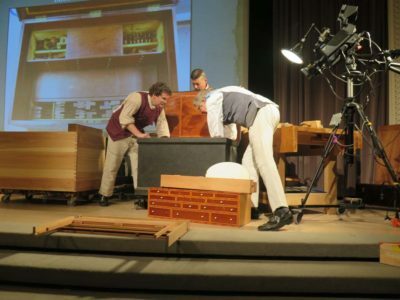 Recreating history is easier when you know all the secrets. 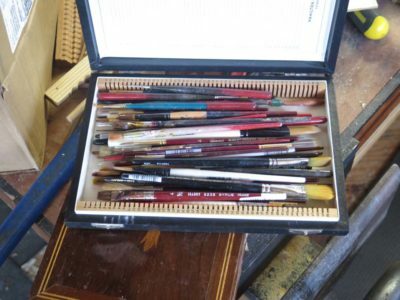 Apparently (well, actually more than apparently) at a gilding demo many moons ago some idiot had packed this box of treasured brushes in the wrong tub of supplies. Protection against self-incrimination prevents me from identifying the idiot. 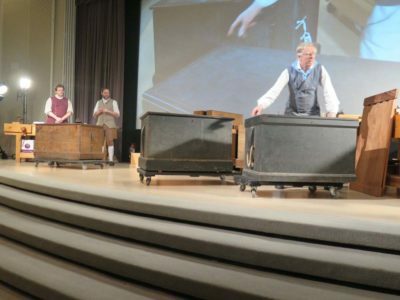 As if WW18thC 2018 was not already wonderful enough! 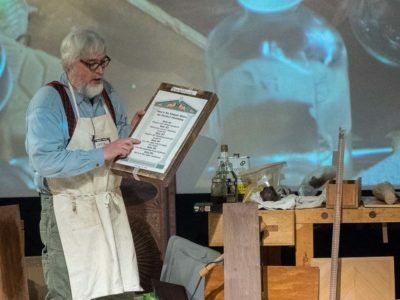 The last session at WW18thC was my presentation of Historic Gilding and Finishing, including a brief sprint through the application of gold leaf. 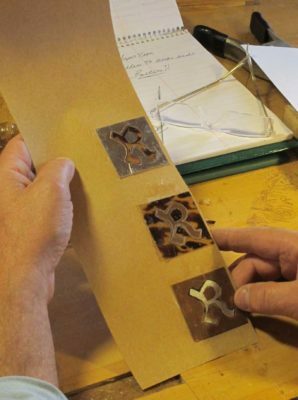 I described processes of gilding with a particular emphasis on building the surface (wood, gesso, bole) to make it amenable to the laying of gold leaf. 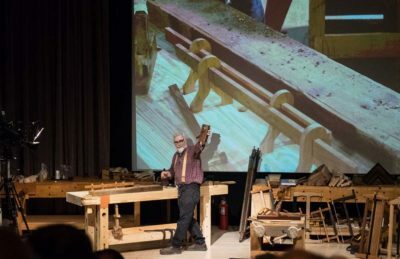 It was only a few minutes, but gilding is a topic that can be introduced in either ten minutes or ten days, nothing in between makes much sense. 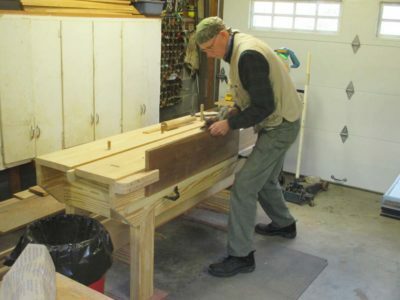 As quickly as I could I changed gears to get to transparent finishing, relying as always on my Six Steps To Perfect Finishing, a rubric that has served me flawlessly since I came up with it a couple dozen years ago. 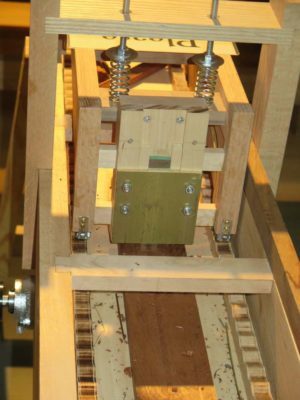 Not every one of the six points got the same emphasis here, that was not practicable given the time constraints, but the conceptual model was followed closely. 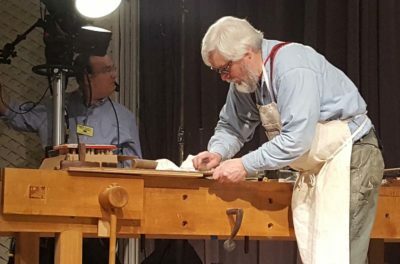 As always the starting point was surface preparation, including using toothing planes, scrapers, and pumice blocks that were integral to the finisher’s tool kit 250 years ago. 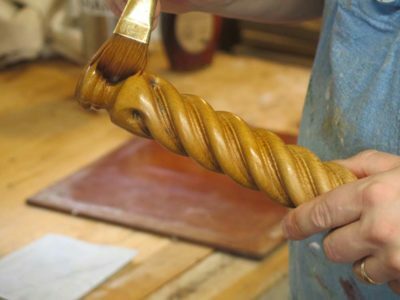 The final step in surface prep was to burnish the wood with polishing sticks or fiber bundle polissoirs. 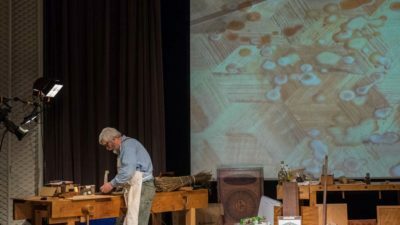 I then moved into the no-man’s-land of filling the grain and building the foundation for the finish yet to come, employing the traditional method of using beeswax as the grain filler. In some circumstances this is the finished surface, in others it is the foundation. 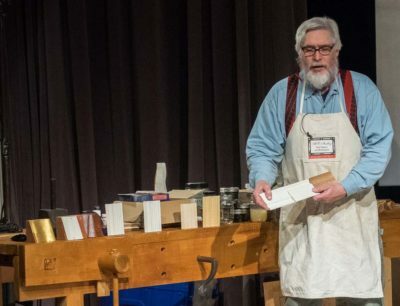 In olden times they would have used a fire-heated iron to melt on the beeswax, I use a similar shaped tool that is electric. The molten wax is drizzled on to the surface then distributed with the heated iron unto there is excess. After cooling any excess is scraped off. 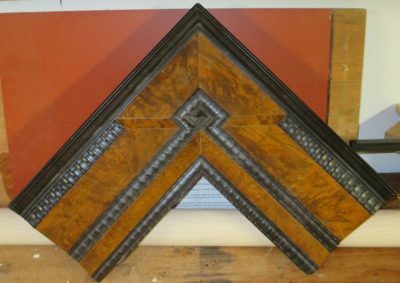 When choosing the finish itself, an 18th century palette would have been based on four major families of finishes. 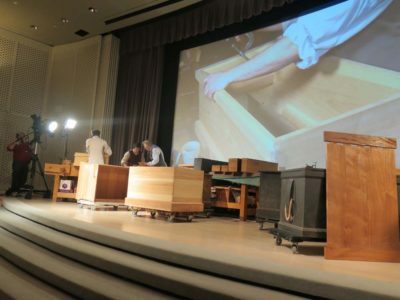 From left to right they are shellac, linseed oil, beeswax, and colophony (pine rosin). 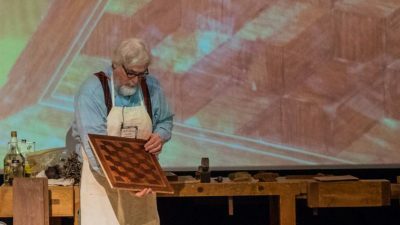 In this demo I used padded spirit varnish (shellac) to show the application of the finish over the beeswax grain filling. And then my time was up and everyone went home. 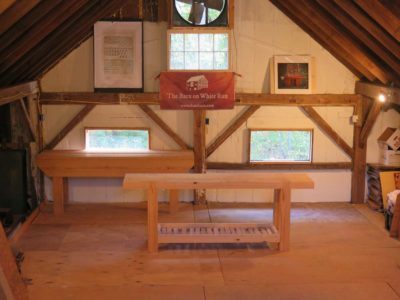 I’ll be offering my annual Historic Finishing workshop at the barn in late April. Let me know if you would like to participate. 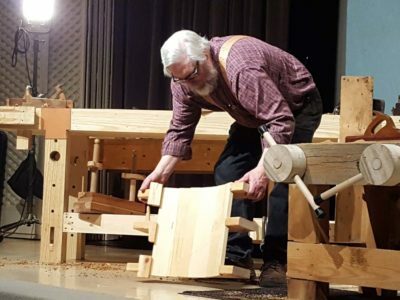 Since our first-ever convening of the International Ripple Molding Association last spring JohnH has been an enthusiastic fellow traveler along this road, and once he got home he started building his own following the instructions of Roubo as closely as practicable. 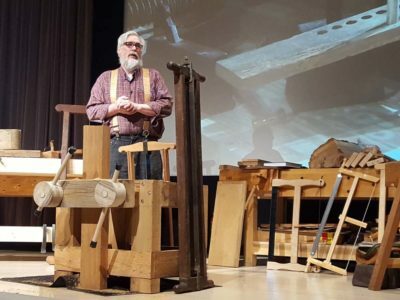 Inasmuch as he had it finished and working I asked him to bring it with us to Williamsburg, since I had already asked him to be with me on stage when we were demonstrating Winterthur Museum’s ripple cutter made by my longtime friend and colleague Cor van Horne. 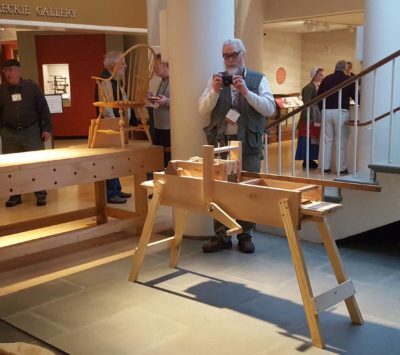 While demonstrating we were able only to get the Winterthur machine before we ran out of time, but we arranged for John’s machine to be on display out in the atrium of the museum. 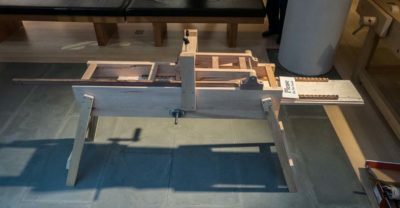 There was a great deal of interest, including mine, and it would not surprise me to learn of several copies being made in the world of historic furniture making. 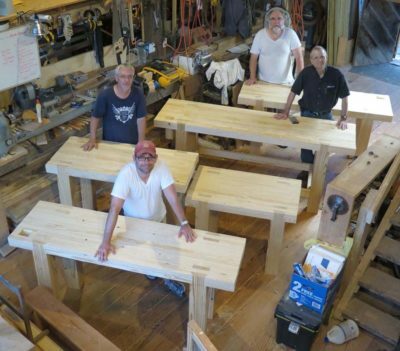 I know that one will begin to take shape in The Barn in the not too distant future. 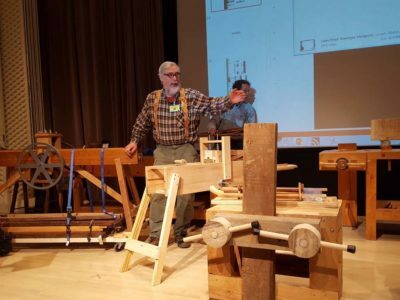 In addition, as John and I continue to develop our designs and facility in building these elegant little machines, we decided to offer a workshop on building your own ripple molding cutter at The Barn in late July 2019. 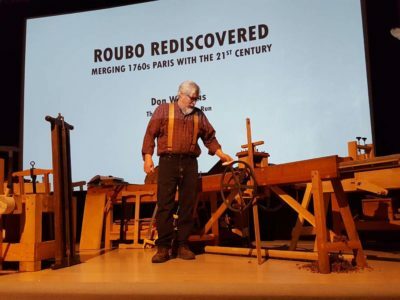 The first of my two WW18thC presentations was “Roubo Rediscovered – Merging 1760s Paris with the 21st Century” in which I recounted the nuggets gleaned from The Roubo Translation Project and how I have incorporated them into my current work practices. Not too surprisingly this is a topic on which I could speak and demonstrate literally for days, but I packed as much as I could in 90 minutes. and finally ripple molding cutter my friend and collaborator JohnH. Each of these items will be addressed individually in coming blog posts. 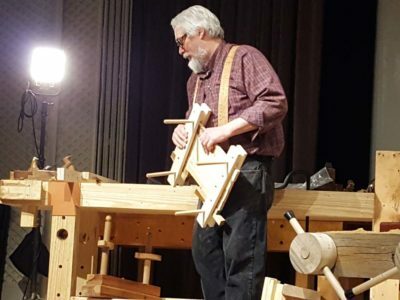 The overal; topic of Roubo’s Workshop is a huge one and I am outlining an extensive video series to explore it in depth (more about that later this week). 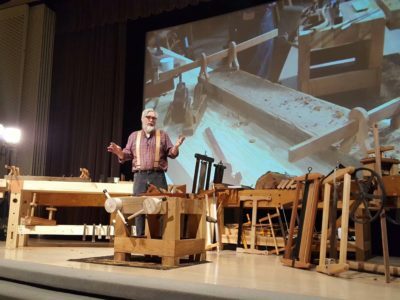 My thanks to JohnR for pictures of this presentation. I would have taken them myself but I was busy at the time. 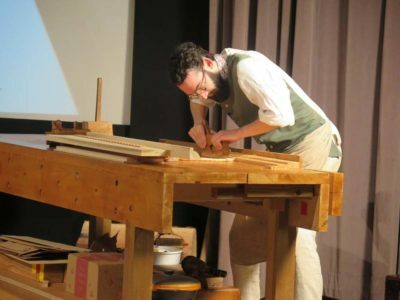 One of the more recent additions to the WW18thC conference has been Ted Boscana’s crew from the CW housewright shop. 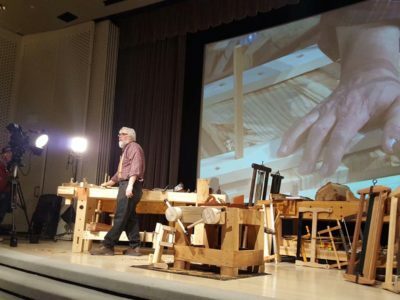 I never fail to learn a lot from these presentation/demonstrations and find Ted to be enjoyable company when we are together. 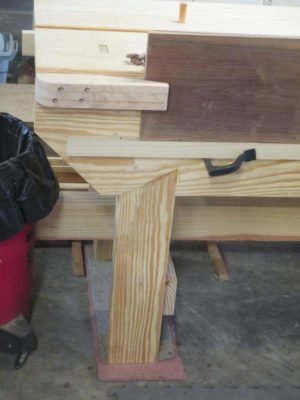 This year the Joiner’s Gang was reproducing some architectural-scale cornice moldings and I found their approach to be immensely engaging. 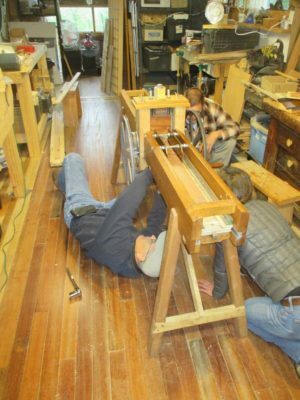 Ted divvied up the sections of the molding profile among his posse of Amanda, Peter, and Scott and they set to work. 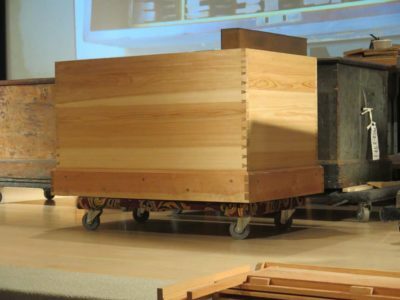 Although the scale at which they were working lends itself to segmented work, they were also demonstrating some of the complex planes in the CW collection. 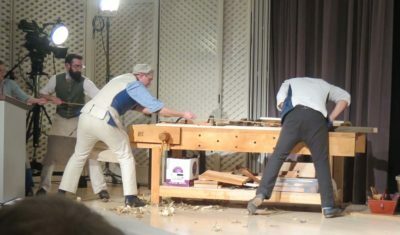 As a finale, with one of the large complex molding planes, Ted placed his full weight over the plane body and the posse pulled him along on top of the workpiece with a rope. 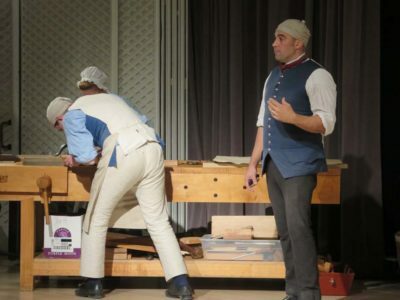 With the challenge of interpreting a decorated 18th century tool chest, the three maestros from the Anthony Hay Shop – Kaare Loftheim, Brian Weldy, and Bill Pavlak – took stage to discuss and demonstrate the paths that they had taken individually to fulfill the task. Soon the small stage was filled with tool chests old and new. 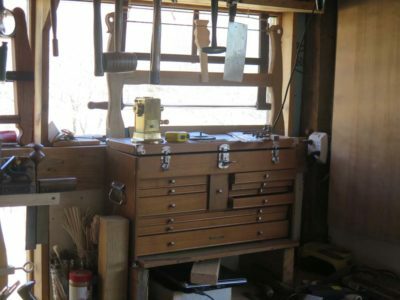 I found this to be a fascinating discourse on not only the organization of tools within the chest but the selection and availability of the tools themselves. 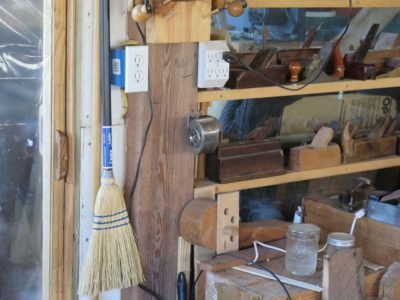 Three makers, three approaches to the problem. 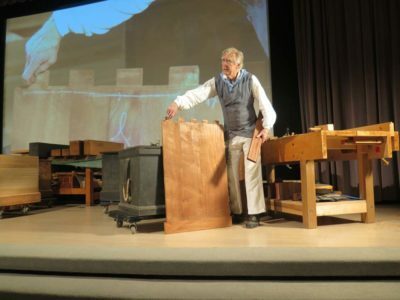 I think this was Kaare’s earlier replica of the Seaton tool chest.